I realize some towns/cities/companies have minimum usages for utilities and water. If you are above the minimum usages, you want to get down to those if you can. You can also call and try to negotiate the minimum usage amount, but most places do not allow that. 1. Shut off the lights. Most houses are lit up like they are a light show. If you are not in the room, shut off the lights. Use lamps, oil lamps, or candles instead of overhead lights to save money. During the day, use natural lighting. 2. Unplug the small appliance especially the ones with lights or a display. They draw power even though they are not in use. 3. Hang your laundry instead of using the clothes dryer. You can hang inside or outside depending on your weather. Hanging inside during the winter also provides some needed humidity too if you live where it is cold. 4. Plant trees to shade your home. Tree shade keeps a home cooler and is better for the environment. 5. Fix your leaking faucets. You lose a lot of water with a leaking faucet. If you have well water, you are losing electricity too by keeping the well pump running. 6. Use low flow showerheads. These also help save money and you still have good water pressure for a great shower. 7. Clean or replace the faucet aerators (screen on the end of your faucet) to use less water. 8. Replace old dying appliances with new (or newer) energy efficient ones. 9. Use your grill or firepit to cook a meal instead of the stove. 10. Have a no television, no electronic times of the day. Extend this further by having a no television week every month. Not having the television on will save money and using electronics less will save on charging times. 11. Plastic on the windows during the winter to cut down on drafts and keep the house warmer. 12. Set the thermostat lower in the winter and higher in the summer when you are gone from the home. 13. Set the thermostat two degrees lower than usual in the winter and two degrees higher than usual in the summer to save money. 14. Get an energy audit done by your local utility company. They will tell you where you can make changes and often you get a free kit for the having the audit done. The audit isn't always free though. 15. Turn down the water heater to 120 degrees or lower yet. You can still take a hot shower with 120-degree water. 16. Set a timer for showers. Most people do not need more than ten minutes for a shower. Teenagers seem to forget this so set a timer. 17. Only flush your toilet every 2-3 trips. You know the saying, "If it is yellow, let it mellow. If it is brown, flush it down." You do not need to flush the toilet every time you pee. Worried about pets or toddlers? Use a toilet lid lock so they can not get into the toilet. 18. Put a brick covered in plastic wrap in the toilet tank to reduce the amount of water needed to flush. 19. Have a leaky toilet? Replace the seal, replace the float, and/or replace the toilet. If you are replacing the toilet, definitely spend the money for the low flow toilets. Most of those toilets use less than two gallons of water per flush. 20. Save the warm-up water from your showers. You can use this normally wasted water for flushing toilets (shut off the water to the toilet first) or watering plants. 21. Check your water heater. Have the water heater serviced or learn how to service it yourself. Flush the water heater out once a year to remove sentiment. If it is over 20 years old, consider replacing it with a tankless water heater or something much more energy efficient. 22. Warm your water heater with an insulated blanket if it is in an unheated basement or room to reduce heat loss from the tank. You can also wrap the pipes coming from the water heater to prevent heat loss further which causes your water heater to work harder. 23. Set up a rain catchment system. Catching rainwater to use for watering lawns and plants is certainly going to save you a lot of money. Some cities/townships/counties/states do not allow for this practice so check your local laws. You may need to have it flow into hidden tanks if you want to do this. 24. Check the seals on your doors. You can lose a lot of hear/air from doors that are not properly sealed. Replace the seals if you can. If they are doors you do not use, seal them off completely. 25. Close off rooms you do not use. Unless there are pipes in those rooms, you can shut off those rooms. Close off the heat vents and close the door. You can always open them back up and turn the vent on again if you need to use those rooms. 26. Switch out any old electrical plug-ins and light switches. Most of them become weak over time and do not securely hold the plugs in right. 27. Use thermal lined or insulated curtains to keep rooms cool or warm depending on the season. 28. Use solar power whenever possible. You may not be able to purchase a large system, but you can take advantage of solar chargers or small solar panels to run small appliances. 29. Use a wood stove or a wood cookstove instead of electric or gas to keep your home warm and cook your meals. Some insurances do not allow wood stoves so you will need to check into this and maybe switch insurance companies. 30. Fill your sink with water when washing dishes. Fill one side or a tub with wash water and the other side with rinse water. You waste more water by running the faucet than you do with just filling the sink. 31. Use draft stoppers on doors. If you do have a bad seal on a door or an inside door leading to an unheated area, you can make or purchase a draft stopper to seal off the door better. 32. Wear more clothes in the winter and fewer clothes in the summer. Most people do not want to be uncomfortable. However, you can add layers of clothes in the winter to keep the heat bill down. There is also nothing wrong with wearing a fleece jacket, stocking cap, and fingerless gloves inside the house in the winter. 33. Add more blankets to beds in the winter to keep the heat down overnight. 34. Only shower every other day if you can. A good deal of people do not need to shower every day. Most kids under the age of twelve only need to shower or bath 2-3 times a week. Most people just do not get dirty enough or gross enough to shower every day. However, if you do get really dirty and/or sweaty every day, shower. If you have an illness in the house, please shower or bath as often as possible. 35. You do not need to wash your bedding every week. Save your water bill and wash your bedding every 2-3 weeks. If you are worried about the sheets being gross, shower before bedtime or sleep on a towel. 36. Only run full loads of dishes in the dishwasher and full loads of laundry in the washing machine. With most washing machines, you can at least adjust the level load to keep the water usage down. However, you will save money on your electrical bill by only running these machines with full loads. 37. Kids do not need a full bathtub to get cleaned. Save your water bill some more by only using no more than five inches of water in the bathtub. If they are toddlers or preschoolers, you can use even less water. 38. Keep rooms clean and uncluttered. If the rooms are dirty and cluttered, they will take more energy to heat because they are trying to heat your stuff too. 39. If you are using the oven, try cooking multiple things in the oven at the same time to conserve power. If you are baking a casserole, plan to bake bread or bars at the same time. You can also put potatoes or vegetables into roast for another meal. 40. Have blankets available to use and cover-up. You can keep the heat lower while everyone is just sitting in the living room watching television. 41. Wear clothes more than once to keep your laundry down and use less water. Most of our clothing can be worn more than once (yes, undergarments are the exception). Unless you get gross and dirty, you can wear clothes at least twice if not more. You can wear the same pair of pajamas all week. 42. Open your windows instead of using the air conditioner. Most people need to air out their homes on a regular basis anyway. Unless you live in a really dirty area or have severe allergies, you should be opening your windows to save money. 43. Look for opportunities to shut off your heat or air conditioning. Unless it is really humid or hot (over 85 degrees), I keep the air conditioner shut off and will open the windows if I can. The heater gets shut off if the outside temp is over 60 degrees during the fall, winter, and spring. Most of the time, the heater will not run anyway because the inside temp will stay over 65 degrees during the day, but I like to shut it off and see how long we can go before turning it on. Once the inside temp drops below 58 degrees, I will turn it back on. 44. Are you using a small appliance for something you can do easily by hand? You can really nit-pick here, but you could use a manual can opener inside of an electric one. You can use a whisk instead of an electric mixer. The list goes on, but you are trying to save money. The little savings add up too. 45. If it is winter, keep moving. In the winter, we tend to get colder because we sit more. We naturally want to hibernate or do as little as possible. However, to keep your body heat up and the thermostat turned down, you need to keep moving. You can deep clean a room, clean house daily, and more. Just keep moving around. 46. If it is summer, consider energy conservation for yourself. In the summer, we tend to do things that make us hot and sweaty which causes us to turn the thermostat lower to stay cooler. Keep the heavy work for morning or late afternoon/evening. If you feel the need to heavy, sweaty work during the day, consider a cool shower or even an outdoor solar shower bag to cool off instead. 47. In the summer, cook outside or eat cool meals. Heating up the house will make us want to adjust the thermostat. Keep the cooking outside if you can. If you are a canner or caterer, consider installing an outdoor kitchen to keep the heat outside. 48. Unplug electronic devices after they are done charging. Most chargers still keep drawing power after they are done charging. Unplug them or put them on a power strip you can shut off so they are not drawing power anymore. 49. Use slow cookers, toaster ovens, and electric skillets instead of using your stovetop or oven. They use considerably less energy than a stovetop or oven. 50. Replace your standard light bulbs with a CFL or a LED bulb. Some bulbs are better than others, but all of them will save you money over the incandescent bulbs. I will say this: from experience, it is far better to invest money in the LED bulbs and get a better quality for better lighting. Going with cheap bulbs will more than likely result in less quality lighting. 51. Consider changing your outdoor lighting to LED or solar lights. We also use dusk to dawn lights and motion sensor lights. We replaced and added a good deal of our outdoor lights last year with no impact on the utility bill because we choose LED and solar lights. 52. If your furnace or central unit is over 20-25 years old, consider replacing it. The newer systems use considerably less energy and have many more options to make them a better fit for your home. 53. Insulate your attic. A contractor friend told me one time that most people could save a lot of money if they would just insulate their attics. A lot of homes have uninsulated attics and lose a lot of heat through those attics. Make sure you have at least 8-12 inches of insulation on your attic floor to keep the heat escaping through your roof. Be sure to check your insulation every few years because it can settle and collapse. 54. Borrow and use a kill a watt monitor and find out if you have any appliance or electronics that are sucking power without you being aware of how much. You would be surprised how much aquariums and dishwashers use. 55. Consider replacing your thermostats. After a time, they become unreliable and could be heating your house or rooms warmer than they should be. We replaced one a year ago after realizing that the room seemed very warm. Using a thermometer, we discovered the room was really almost 80 degrees instead of the 65 degrees the thermostat was set at. Every year, you should be checking to see if they are accurate by using a thermometer and checking the temperature. This is just some of the ways you can save money on your utility and water bills. Some of these may be too extreme for some of you and that is okay. Some of these may cost too much money for you now to implement them. That is okay too. Just take care of them when you have some money saved up. 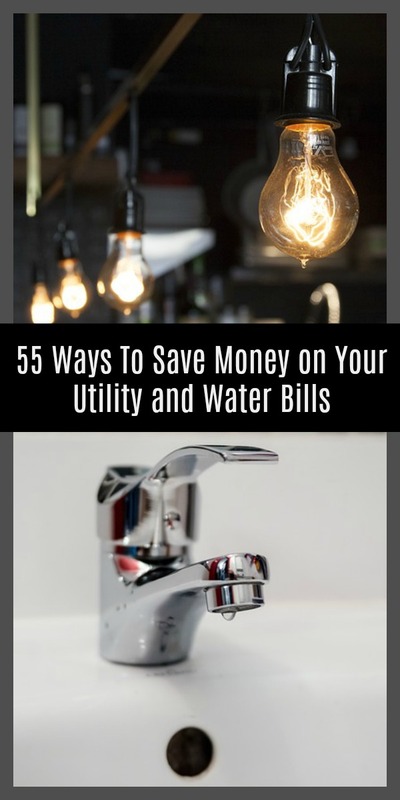 There are many, many more ways to save money on your utility and water bills too. I plan to have a part 2 coming, but I would love to hear your ideas! Please leave them in the comments below! Start Saving Money by Having A Poverty Mindset: Learn 25 Ways To Extreme Living and Saving! 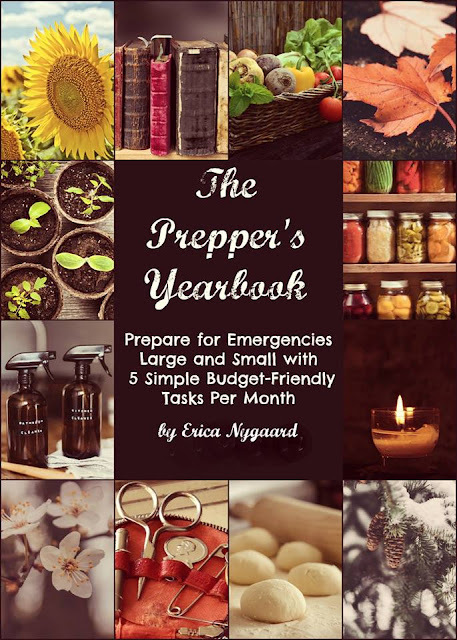 What Place Does Extreme Frugality Have In Your Life? Can You Live In Extreme Frugality?